Greaterville is, or rather was, a small mining town in the northeastern foothills of the Santa Ritas. Reportedly, it was named after a pioneer named Greater. Today, it is noticeable only as a couple of fence lines and cattle guards marked with private property signs that one must cross to get to the Greaterville Trailhead. 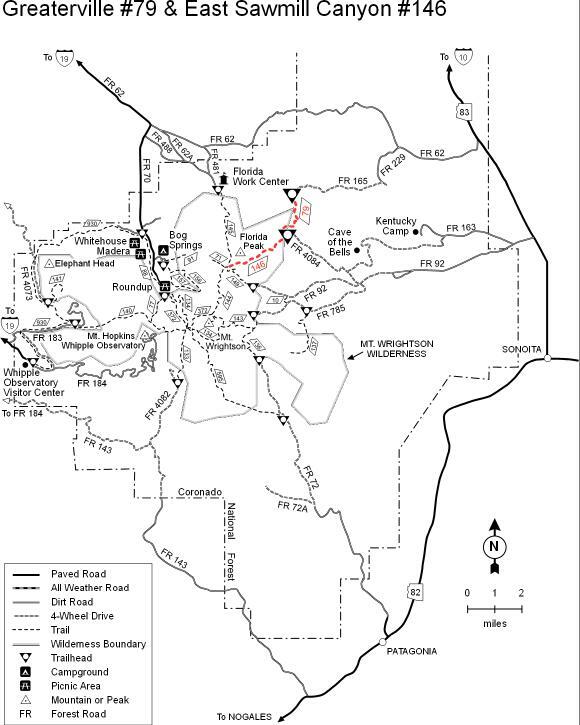 The Greaterville Trail, combined with the East Sawmill Canyon Trail, provides access from the northeast to Florida Saddle, one of the major trail crossroads in the Santa Rita Range. This saddle marks the beginning of the Crest Trail #144 that leads to the summit of Mt. Wrightson. The Greaterville and East Sawmill Canyon trails pass through an area of rugged, scrub oak-clad ridges and forested canyons that slope gradually toward the Santa Ritas. Both offer views to the east, of the Whetstones and Mustangs, as well as to the west of Mt. Wrightson and the Santa Rita Crest. Closer at hand, ponderosa pines, alligator junipers and Emory, white and silverleaf oaks make up most of the scenery. This area is good wildlife habitat. There are healthy populations of Coues white-tailed deer in the area, and if your eye is sharp enough to see them before they flush, you might spot some scaled quail or Montezuma quail. From the western terminus of East Sawmill Canyon Trail you can head north into Florida Canyon, south and east along Cave Creek Canyon or continue along the Crest Trail to the top of the Santa Ritas. Greaterville Trail: Leave Interstate 19 at the Continental Road/Madera Canyon Exit. Turn east and follow the Madera Canyon Road 7.3 miles to the FR 62 cutoff. Turn east on FR 62 (Box Canyon Road) and continue along this scenic drive about 9 miles to FR 229. Turn south on FR 229. Follow it across the private property at Greaterville to FR 165 and turn north and west past Melendrez Pass to the trailhead at the end of the road. East Sawmill Canyon Trail: 21 miles south of Interstate 10 and 4 miles north of Sonoita on AZ 83, turn west onto Gardner Canyon Road (FR 92). Keep to the left at three-quarters of a mile and take the right fork (FR 4084) at about 4 miles around a piece of private property then continue about 7.5 miles to the trailhead. The last 5 miles or so of this road requires a high clearance 4-wheel drive vehicle.